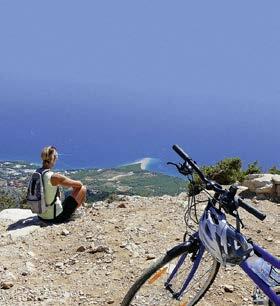 From 11:30 am to 1:30 pm, boarding time in the port of Trogir, our bicycles are awaiting you already on board. If you arrive by your own car, you can proceed to the parking reception (as indicated in your travel documents) already from 10:00 am. Upon arrival, our staff will show you where to park and unload your car. Our service-team will take your luggage to the port. After embarkation, our representatives and guides will welcome you aboard with a drink and you will meet the crew and your fellow passengers. After a lunch snack “Cast off!”, heading towards Maslinica on the island of Šolta. Šolta is one of the smaller Dalmatian islands and is known among connoisseurs for the high quality dark olive oil. We will ride through traditional old villages – Lower Village, Middle Village, Upper Village – that’s how the three villages on the island are called (Donje, Srednje, Gornje Selo). 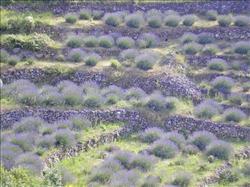 In Gornje Selo, we will visit an olive oil mill, where we will enjoy olive oil tasting as well. Passing Grohote, we will reach Stomorska, where we will load our bikes on deck, before heading to Milna on the island of Brač. In Milna we will have dinner and stay overnight. (18.6 kilometres by bike). Today we will cross the island of Brač, from west to south – our destination is the resort of Bol, featuring one of the most beautiful beache of the Mediterranean area, the Zlatni Rat (the Golden Horn). The tour takes us from Milna via Ložišća, Dračevica, Nerežišća and Gornji Humac to Bol – on our way to Bol, we will stop for lunch and enjoy a glass of wine in a typical Dalmatian “Konoba” (not included in the cruise price). Those who are aiming even higher, after riding uphill to the height of some 500 m above sea level, can join us all the way up to the Vidova Gora mountain – with its 778 metres the highest mountain on the Adriatic islands. You will be rewarded with a magnificent view over the islands of Šolta, Hvar and Korčula, the peninsula of Pelješac and the “Golden Horn” beach. Dinner and overnight stay in the picturesque harbour of Bol (42.9 or 55.5 km). During breakfast, we will sail to Stari Grad on the island of Hvar. Hvar is the Adriatic island with the most hours of sunshine and the mildest climate. Our first today’s bike trip leads us via Vrbanj and Jelsa to Vrboska, and all the way back to Stari Grad. Sightseeing of Stari Grad, the oldest settlement on the island. Afterwards you can have lunch in one of the restaurants in Stari Grad. After lunch, you can decide either to continue by boat, or to ride by bicycle through endless fields of lavender and vineyards via Velo Grablje to the capital Hvar, where in the afternoon we will meet our ship again. After having had some time to explore the town, we will set off for a nearby bay, where we will have dinner and spend the night. (21.1 or 42.2 km). After breakfast, we will set off for the “forbidden” island of Vis. Under socialist rule there was a major military base on the island, therefore foreigners were not allowed to visit. As part of the democratization of the country, the military has withdrawn, and on the former runway of the military airport now wine is cultivated. Vis is a subtropical paradise boasting an amazing countryside. 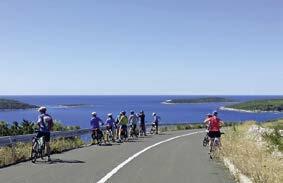 Upon arrival at the port of Vis we will continue by bicycle to the second major town on the island – Komiža. Passing the small place Dračevo Polje, we will reach Komiža, where you can have lunch at one of the restaurants, before returning back to Vis. Dinner on board. 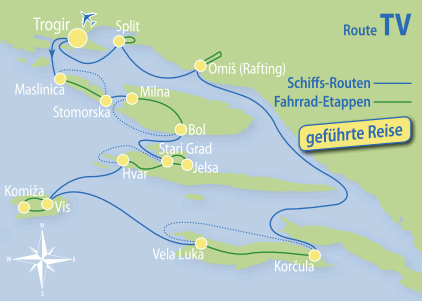 Overnight stay in the port of Vis (31.7 km). “Cast off!” early in the morning, and after about three hours, we will run into the bay of Vela Luka on the island of Korčula. The island – its antique name is Korkyra – is also called “the Black Island”, due to its vast pine forests. Passing Blato, Smokvica, Čara, Pupnat and Žrnovo, we will reach the town of Korčula, located in the south-east of the island. On our way we will stop at a “Konoba” or a tavern. Dinner is served on board, with a magnificent view on the stunning backdrop of the old town of Korčula. Overnight stay in Korčula (48.3 km). We will leave Korčula early in the morning, enjoying fabulous views of the old town in the rising sun, while heading north-west to our next destination. Passing the peninsula of Pelješac and the islands of Hvar and Brač, we will have lunch on our way to Omiš, a picturesque town on the mainland. Omiš boasts a privileged seaside position and is located at the mouth of the Cetina river. In thousands of years the Cetina river shaped a canyon and created bizarre formations in the stone of the riverbed. The crystal-clear water, the high cliffs – up to 180 m –, the waterfalls and lakes offer sights of an unspoilt nature. 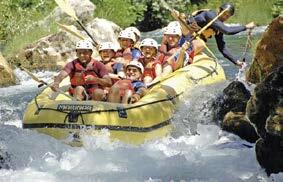 Our today’s bike tour will take us along the Cetina river to the village of Pavića Most, where our rafting trip begins. After being provided with the appropriate equipment (helmet and life jacket), we will get a detailed instruction before starting our 2.5-hour downstream adventure. 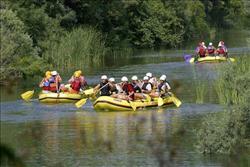 Inflatable boats for six to eight passengers, steered by experienced skippers, will take us down the Cetina, passing smooth rapids, gorgeous waterfalls, and a simply unique countryside, which is home to many rare birds and other wildlife. On our way, we will make two breaks to have an energy snack and to take a refreshing dip in the crystal-clear water. Our destination is the “Radmanove Mlinice”, a unique spot featuring old water mills. Afterwards we will go by bus back to Omiš, from where we will continue our cruise to Split. Tonight we will enjoy the Captain’s Dinner. Overnight stay in the port of Split (18.8 km). 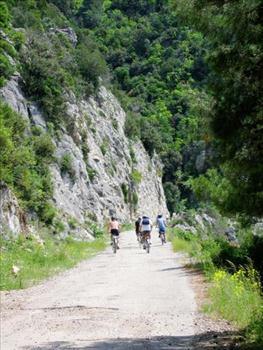 Those who do not wish to participate in the rafting adventure can go by bike from Pavića Most all the way back to Omiš (37.6 km). Split is Croatia’s second largest city and the capital of Dalmatia. The 1700 year old city was built around the palace of the Roman Emperor Diocletian; today it is protected by the UNESCO. 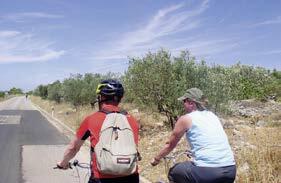 After a guided city tour, we will take an uphill bike tour to the Marjan mountain. 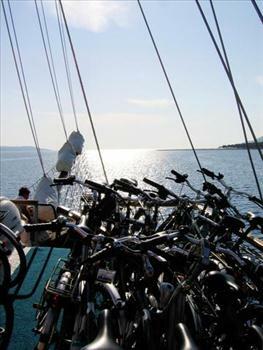 After returning to our boat, and loading our bicycles on deck for the last time, we will set off for Trogir. On our way to Trogir, we will stop at a bay of the island of Čiovo, where we will enjoy lunch and a last swim in the Adriatic Sea. With its amazing old town, protected by the UNESCO, Trogir is also called “the Museum City”. Enjoy the experience of a guided walking tour through the winding streets and discover impressive walls, towers, churches, frescoes and vaults. Do not miss out on taking a look into the unique old yards. 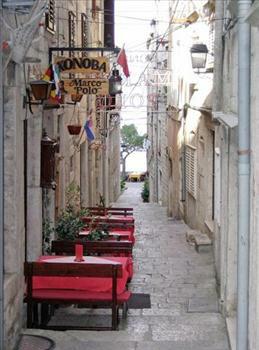 Take the opportunity to enjoy dinner in one of the numerous restaurants in Trogir. Overnight stay in the port of Trogir (18.7 km).